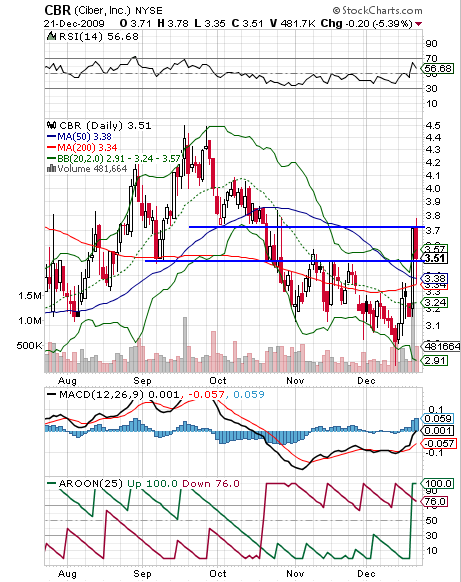 Ciber (CBR) has sure been volatile these last few days. Here's why I find that interesting. The company showed up this past weekend on the Bollinger Band Breakout list at Alert HQ. A look at the chart below shows how sharp the breakout has been. Even though the stock gave up some ground today, it's still up dramatically. Does this mean the company is about to announce surprisingly good quarterly results? Note that the stock has managed to hold above the lower blue horizontal line which was the first level or resistance and which is now acting as the first level of support. The stock has not yet broken through the upper blue horizontal line which is the current resistance level. On the plus side, MACD and Aroon are both starting to indicate a new trend that is pushing to the upside. Many analysts and economics regard temporary staffing as a leading indicator of employment recovery, because many companies, being cautious, will bring on temporary help before hiring permanent employees. Ciber is a tech out-sourcing vendor. They provide system integration and information technology (IT) services to large and mid-size businesses. Their primary expertise is related to development, maintenance and integration of both custom and packaged enterprise software. Contracts are often for temporary engagements. Is the recent surge in the stock price a sign that Ciber's business is looking up? If Ciber is starting to do well, can we consider them to be the leading indicator for the tech sector or at least the enterprise software sector? If so, it might be a good time to consider the iShares - S&P North America Software ETF (IGV). Indeed, IGV hit a new high today. The fund includes companies that are producers of client/server applications, enterprise software, application software, and personal computer (PC) and home entertainment software. An improvement in software consulting now could be the precursor to improving sales in enterprise software and subsequent hiring in this sector. If so, IGV and Ciber could both benefit. Let's see if Ciber can break on through that next support level.